UC Santa Cruz alumnus Lawrence Weschler graduated from Cowell College in 1972, where he studied Philosophy and Western Civilization. His new book (above) was just published in January. 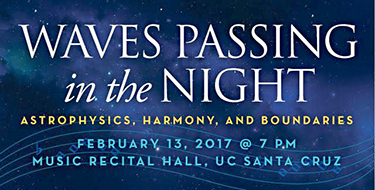 Acclaimed writer and UC Santa Cruz alumnus Lawrence Weschler will join Academy Award-winning sound and film editor Walter Murch, and noted campus astronomer Enrico Ramirez-Ruiz, for Waves Passing in the Night: Astrophysics, Harmony, and Boundaries, on February 13, at 7 p.m., in the Music Center Recital Hall. 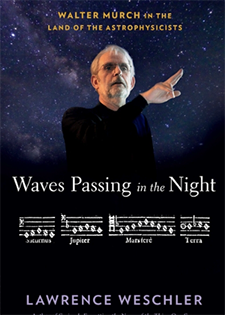 The occasion is a conversation on astrophysics, acoustics, and disciplinary boundaries celebrating Weschler’s brand new book, Waves Passing in the Night: Walter Murch in the Land of the Astrophysicists, just published by Bloomsbury, USA. The book profiles Murch, a film legend and amateur astrophysicist who is well-known for his work on such classic films as Apocalypse Now, The Godfather trilogy, and The English Patient. It focuses on Murch’s passion for astrophysics, in particular the rehabilitation of Titius-Bode, a long abandoned 18th century theory regarding the patterns by which planets and moons array themselves in gravitational systems across the universe. Weschler graduated from Cowell College in 1972, where he studied Philosophy and Western Civilization. A critic, journalist, and author, he was a staff writer at the New Yorker for more than 20 years. Weschler’s books include Mr. Wilson's Cabinet of Wonder, for which he was shortlisted for the Pulitzer Prize and the National Book Critics Circle Award; Boggs: A Comedy of Values; and Everything That Rises, which received the 2006 National Book Critics Circle Award for criticism. This event is part of the UC Santa Cruz Original Thinkers series and is sponsored by Cowell College, the Institute for Humanities Research, the Film & Digital Media Department and the Astronomy & Astrophysics Department at UC Santa Cruz.